It's Friday Photo Flashback and I'm linking up with Alicia of More Than Words. I have so many pre-digital camera photos that it's a fun time to share a few of them with you. My photo for this week dates back to July 10, 1960. We were celebrating my brother Steve's ninth birthday. I remember this day vividly, even though I was only seven years old. Ten days later I had open heart surgery to correct a congenital heart defect. My Nana Sumstad is holding my baby sister Christine in her arms. My mother is holding the cake for Steve to blow out the candles. 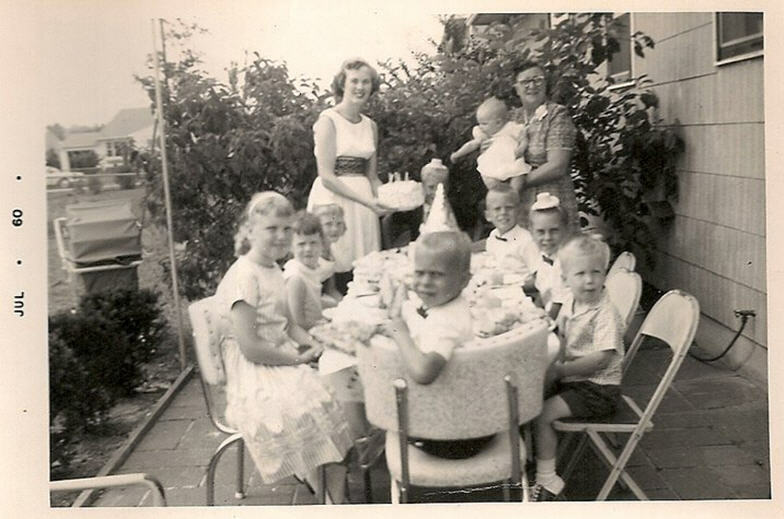 I am the little girl sitting closest by my mother. My brother Steve corrected me on that one. It's hard to be sure in these old photos; sorry Randy who is in the front. LOL. Wow, thanks for sharing your memories sis. I love you. What great memories! Interesting how poeple's lives change...those we grew up with...some good...some not so good. Oh wow, what a precious memory & picture! Thanks for sharing with us Debbie. I always enjoy your flashbacks! You have such vivid and fond memories of your childhood! That is such a blessing!! Have a wonderful Friday, my friend! Love ya! I love these pictures my friend and the memories that go along with them. How cool! always love going down "memory lane" with you. Such wonderful, simple times. Your mom is gorgeous! I love her dress. And my goodness! I didnt know that you had open heart surgery when you were seven. Thank the Lord for that successful surgery! I love this picture! It looks like something from a magazine. Everyone looks so cute!!! Hello there...I'm hopping in from Alicia's Friday Photo Flashback. That is a nice photo! My favorite photos to look at are the one when my mom was a child growing up. I love looking how my grandparents, aunts & uncles were so happy and carefree back in the 1960's. Totally love the pic. Thanks for sharing. I use to have parties like that. In fact your kitchen chair looks like ours use too. ~hehe~ Thanks for stopping by my blog. Hope you enjoyed it. What Do You Think of When You Hear Summer?